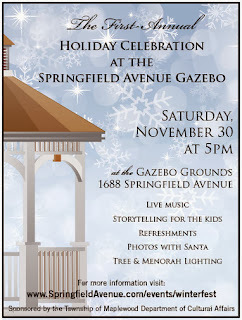 Come out to the first ever HOLIDAY CELEBRATION AT THE SPRINGFIELD AVE GAZEBO! 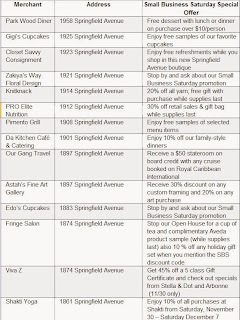 Kick off your Holidays on Springfield Avenue on with special Small Business Saturday savings and holiday treats on Saturday, November 30th. 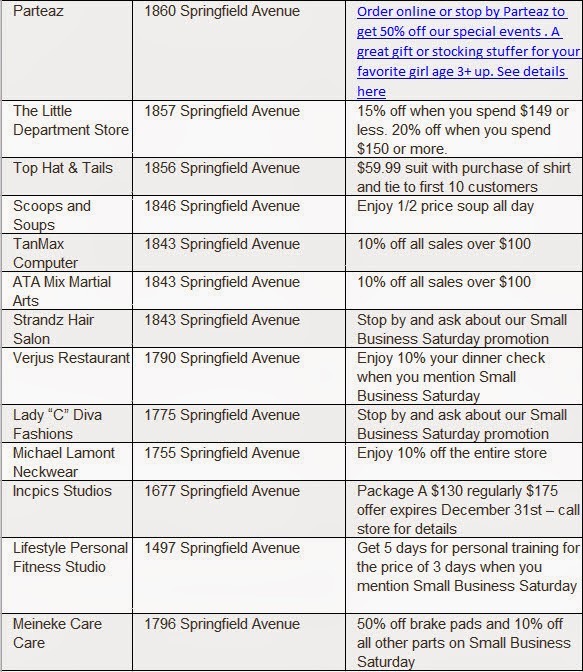 You’ll find over 25 businesses offering you specials savings, merchandise and refreshments while you shop, dine and prepare for the Holiday season. This is your chance to kick off your holiday shopping and support your local merchants. 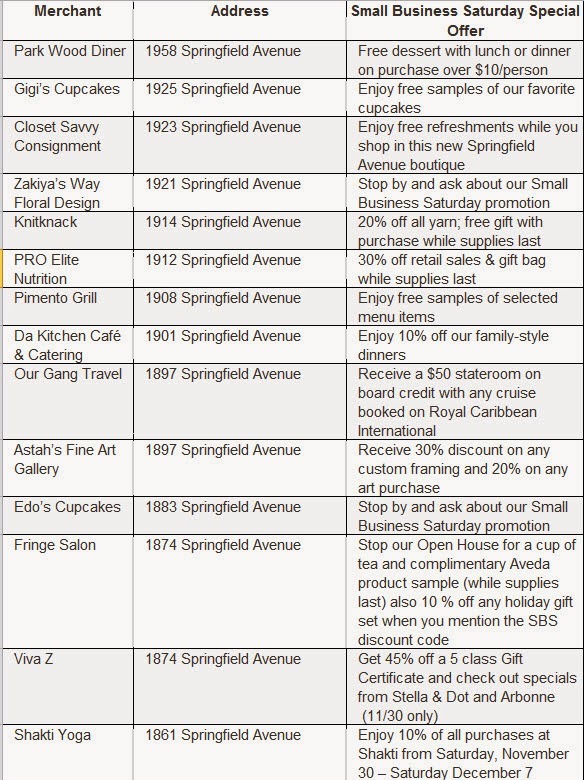 See the list of participating merchants below and look for this poster in the windows of participating merchants. RISMEDIA, Sunday, November 17, 2013— Even as prospective buyers continue to turn to the Internet to search for their dream home, most agents will argue that open houses are still the best way for house hunters to see and feel if a home is the right fit. And nothing beats actually walking through a house and seeing it firsthand. Plus, for...some...buyers—who may not be comfortable looking at homes on the Internet—the only way they’re going to discover the home of their dreams is to go see it in person. ...If you’re planning on incorporating an open house into your home-selling strategy, real estate professionals suggest hiring a professional stager who’ll be able to offer advice when it comes to de-cluttering your home. Whether it’s moving stuff into storage, improving lighting or simply creating an inviting home, stagers will prove to be a beneficial asset throughout the entire process. I am happy to make a couple of recommendations with proven professional stagers as statistics show they reduce time on market and increase prices. Open houses will also go a long way toward attracting a wide range of prospective buyers as they typically draw a cross section of people from...neighbors to those who are just starting their search. They also make it so much easier for buyers that want to see several homes during the same "trip," as Open Houses allow buyers to get in and through a home more quickly, in our time pressed ansd stressed society. While you may not get serious offers from those who are just beginning the process, open houses are a great way to draw attention to your home, especially if it’s priced right. As for my belief in the effectiveness of Open Houses, I consistently average at least one offer for every home I list to SELL. These offers may not ultimately lead to the winning buyer, buyer but do help to stoke the competition in a multiple bid. 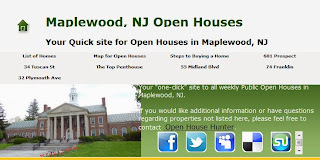 My belief in Open Houses lead to the creation of several Open House Websites that now average 1,500 hits per month each. Buyers who have been pounding the pavement, searching for their dream home might finally find what they’ve been looking for, and since they know what else is out there, it could lead to a sale. Additionally, having your neighbors show up for your open house can prove to be a benefit in disguise. While they’ve most likely been telling their friends about the merits of the neighborhood for years, your home being on the market may be the icing on the cake when it comes to them finally being able to enter the community. To learn more about open houses, contact me today. 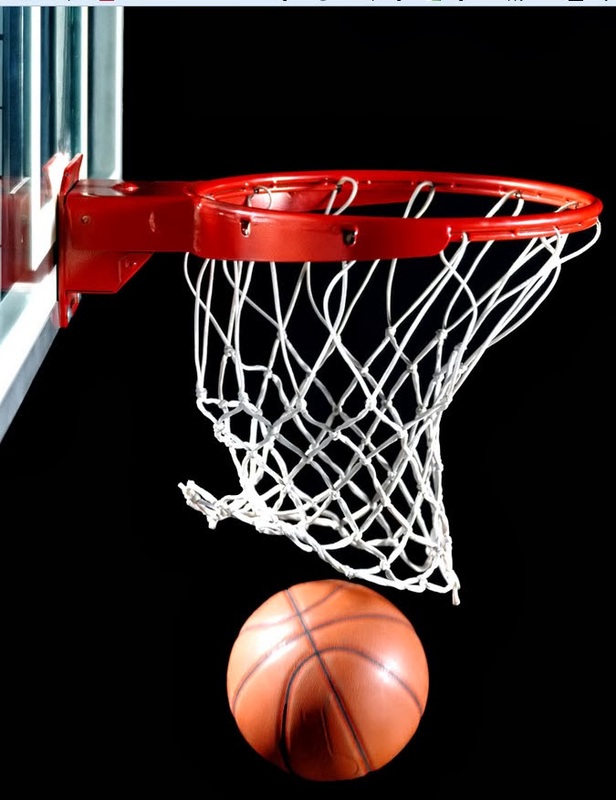 Registration is now OPEN for the Maplewood Recreation Over 30 Adult Basketball League!! • Games played on Wednesday nights beginning January 8, 2014. • All games played at Maplewood Middle School. • At least one player on the team must live and or work in Maplewood/South Orange. • 8 game league, plus playoffs for top four teams. Championship team will receive trophies. • Players will recieve a reversible jersey. 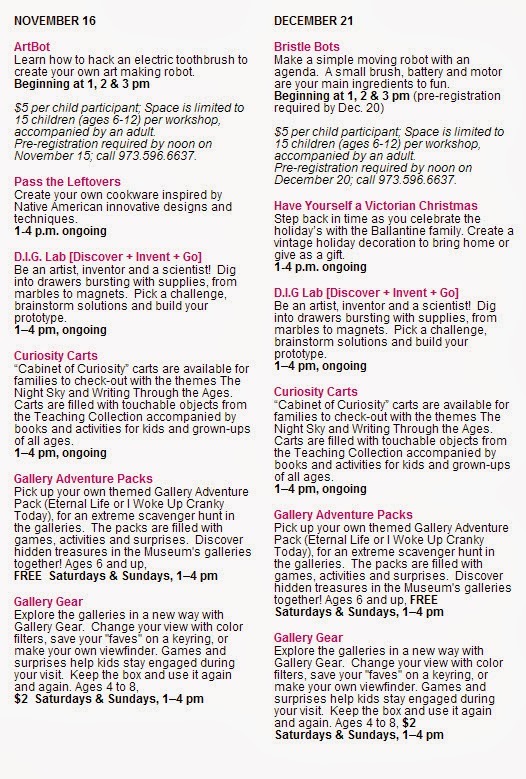 • Registration must be done in person at the Maplewood Recreation Department, or online at https://register.communitypass.net/maplewood, under Winter 2013-2014. • Pre Season Open Gym Sessions will be held, every Wednesday beginning December 4th, from 7:30pm to 9:00pm. In a recovering market, some sellers might be tempted to try and sell their home on their own (FSBO) without using the services of a real estate professional. If the home doesn't sell in the first few weeks, there is a very good chance that the house is either not priced correctly for the market or that the house wasn't property prepared to go on the market. The challenge is that if you exceed 25 Days on Market (DOM), you are going to end up selling for less than the property would have originally sold for if it was priced correctly. Even if the house is priced correctly, are you, as the Seller, able to handle the negotiation and process of getting the sale to the closing table? The real estate agent is a trained and experienced negotiator. In most cases, the seller is not. The seller must realize the ability to negotiate will determine whether they get the best deal for themselves and their family.  The buyer’s attorney (in some parts of the country), agents can help you navigate the terms and process.  The home inspection companies which work for the buyer and will almost always find some problems with the house.  The buyer’s buyer in case there are challenges on the house your buyer is selling. FSBOs accounted for 9% of home sales in 2012. The typical FSBO home sold for $174,900 compared to $215,000 for agent-assisted home sales. 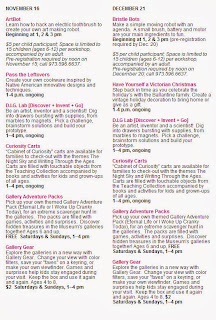 What a great way to spend the day with the kids! Foreclosure Buying a foreclosed home can seem like a dream. What could be better than getting a home for a fraction of the market value? 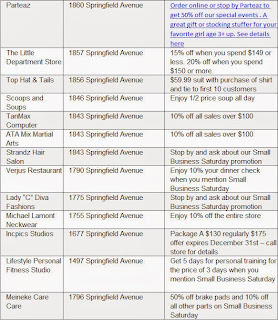 Some may even say that the deals sound like they could be too good to be true. In some cases, those doubters aren't too far off the mark. There are some hidden dangers in buying foreclosure properties that, if you're not aware of them, could be disheartening and disappointing. If you are pursuing this route in buying your new home, be sure to look out for these hazards and hidden costs. Destruction of Property – A sad truth about foreclosure properties is that they have often been purposely destroyed. Sometimes the homeowners do this out of frustration over losing their homes, or out of simple carelessness when they realize their home is irretrievably gone after too many missed mortgage payments. If the homeowners have not destroyed the property themselves, there is also a chance that the home has been vandalized by other people because it has been left sitting empty. Poor Maintenance – If homeowners were unable to afford their mortgage payment, they almost certainly were unable to perform routine maintenance on the property. Problems can be as minor as a few leaky faucets, or as major as damaged roofing or central units. It May Be Unclean – A house being left unoccupied for a significant amount of time can mean it will be unclean, either through neglect on the part of the former owners or normal depreciation as the property is left uninhabited and not looked after. When a homeowner is selling the home, they will scrub the house clean or hire a cleaning service to entice buyers. A foreclosed home will not have this benefit. Depending on how long it was left and what condition it is in, there may even be vermin or termites to deal with. Undesirable Renovations – Sometimes homeowners were in the middle of a renovation when they lost their ability to pay their mortgage, so you can wind up with a half finished project on your hands when you purchase the property. There is also a chance that a garage or basement was turned into a living space to rent out in order to try and offset the cost of the mortgage. No Electricity – There is a good chance the electricity will be off in the foreclosed home, so you will have a hard time seeing what you are buying. Depending on the weather it may also be very hot or very cold in the house, and vacancy can take its toll on appliances left behind. Personal Property Left Behind – Many homeowners leave items behind, either because they now have no place to put them or because they were locked out of the house before they could retrieve them. You will now be left with the job of disposing of these items if you decide to purchase the property. Lack of Landscaping – More than likely, nobody has been maintaining the lawn of a foreclosed home. You may have a yard full of dead grass or a lawn so overgrown it seems like a jungle! Your foreclosed home will almost certainly require some degree of upkeep when it comes to to the landscaping surrounding the structure. No Disclosure – Because the owner of the property is a bank and the bank has not actually lived in the house, they have no idea what problems or issues there may be in the home and they have no obligation to tell you even if they did. You will have to get your own home inspection done to uncover potential issues. Stripped Bare – You may find your new foreclosed home completely stripped of appliances, copper piping, and anything else that might be worth money. Many times the previous owners do this to try and make back some money on their lost home. Other times, the home was broken into and robbed after the previous owners left. 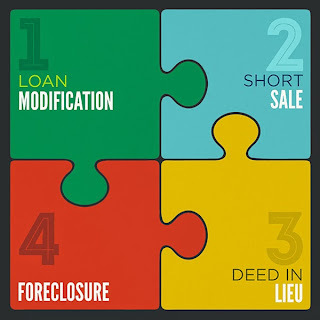 Judgments and Liens – Foreclosure properties can sometimes come with titles encumbered by judgments or liens that you may have to pay off to close on the deal. In short, buying a foreclosed property can be a great way to save money. However, be sure to look into all the potential costs involved before making a final decision. Do the math to determine if you will really wind up saving, or if the property will end up costing you when all is said and done. So, what can you do? Well, there are always the homes that languished on the market and have owners that still want or need to sell. The trick is to find a good agent the help you sort through the many listings to find the right choices for you!